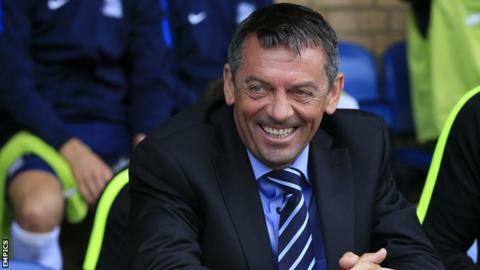 Southend have nothing to fear in League One, according to manager Phil Brown. The Shrimpers are currently two points off the play-offs in ninth place, having won promotion out of League Two via the play-offs last season. "A third of the way through the season I don't think there's anything to fear at this level," Brown told BBC Essex. "I think the players need to start believing in themselves and when they are selected they play well enough to keep the shirt." He continued: "I still think we can do something this year; hanging on the shirt tails of the play-offs isn't a bad spot to be in at this moment in time. "Once we get a real consistency to our game, we need to make sure we go on winning runs and perform to our best of our ability more often than not." Brown's side have won their last three home matches, and host Keith Hill's Rochdale on Saturday. And the former Hull boss believes 11th-placed Dale - promoted in 2014 - are a prime example of a team to have grown since moving up from League Two. "I think about the teams that got promoted two years ago and this year, and everyone of them is holding their own in this division," said Brown. "Rochdale have done that for a couple of years. If we got back to when we used to play them in League Two, Keith Hill's team used to play good football. "I don't think he's abandoned those principles since promotion - he's doing a great job on one of the smallest budgets in this division."